The Galaxy A7 (2017) is one of the many smartphones Samsung plans to update to Android 7.0 Nougat. While not the first to receive the update, the Galaxy A7 (2017) is expected to receive the long-awaited upgrade in the coming weeks. 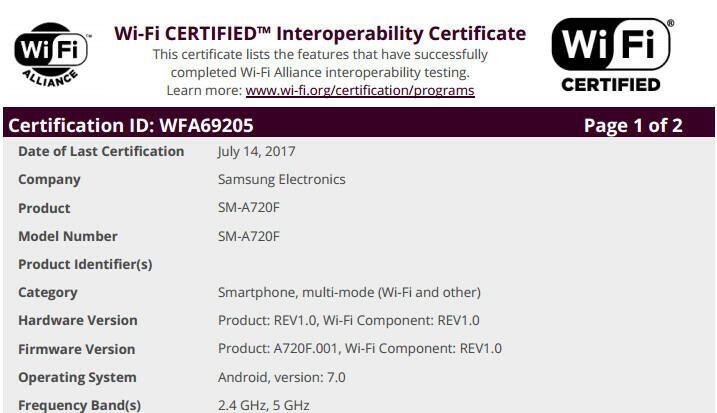 The smartphone, which goes by model number Samsung A720F, has been recently spotted at Wi-Fi Alliance, which isn't unusual at all. However, unlike the original model that was launched by in January, the device listed at Wi-Fi Alliance is running Android 7.0 Nougat operating system. Even though it doesn't give us an exact release date for the Android 7.0 Nougat, at least those of you who own the smartphone can expect the update to hit the Galaxy A7 (2017) any moment now. In the same piece of news, another Galaxy A series launched by Samsung early this year, the Galaxy A5 (2017) appears at Wi-Fi Alliance as well. Just like the Galaxy A7 (2017), it runs Android 7.0 Nougat, which means Samsung is ready to expand the availability of the update to more owners of the smartphone.